All meat is a great source of protein. A grilled, skinless turkey breast contains only 160 calories per 100 grams and 35 grams of protein – this is now considered a superfood. Compare this to a meat free source of protein - cheddar cheese – coming in at 420 calories per 100 grams and only 24 grams of protein. Not to mention the 37 grams of fat compared to only 3.2 in the turkey breast meat! Red meat is also leaner now than in the 1970s, with more awareness of lean breeds and rearing techniques. There is an average 10% fat content in red meat today, compared to around 25% then. There are also a number of vitamins, minerals and nutrients that are found in meat, particularly red meat, with other sources of these benefits being higher fat, more calorific or impractical to eat in the volumes required for the same gain. The nutrients such as iron, zinc and selenium can be difficult to find regularly in other sources, with ‘at risk’ groups such as the under fives, dieter and the elderly often lacking in these important vitamins. Meat is also good for maintaining muscle density and gaining overall strength. Red meat is a great source of folic acid, which promotes tissue growth and cell functions. It is often taken as a supplement by women who are planning to get pregnant. Vitamin A is great for the health and appearance of your skin and reducing the mucus membrane – which helps to reduce your susceptibility to infections. This vitamin also benefits for eyes, bones and teeth strength. The group of B vitamins are important for both physical and emotional health, with deficiency resulting in depression, cracked lips and anaemia. Red meat is an excellent source of B vitamins, helping to support the central nervous system. It is not commonly known that meat is a good source of vitamin c – Eskimos eat almost no fruit or vegetables but remain healthy due to their meat and fish rich diet. Vitamin C helps wounds to heal, maintains a healthy immune system and supports the absorption of iron. 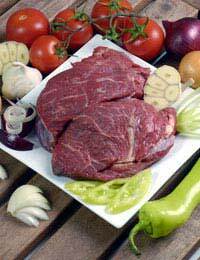 Red meat is the largest natural source of vitamin D, an essential vitamin for maintenance of organs and our bones. Sunlight it also a great source of vitamin D – a lack of which can result in softening of the bones and changes in mood. Seasonal Affected Disorder is aided by a vitamin D rich diet and exposure to sunlight. Consumption of vitamin E is essential for our skin health and appearance as it is an antioxidant that helps our skin fight free radicals. Overall, meat is one of natures most balanced foods – as long as you remove all visible fat and do not eat the calorie and fat laden skin on poultry, a diet that incorporates a balance of red meat and poultry will give you a range of desirable and required vitamins, minerals and nutrients that are needed for a healthy body, inside and out.